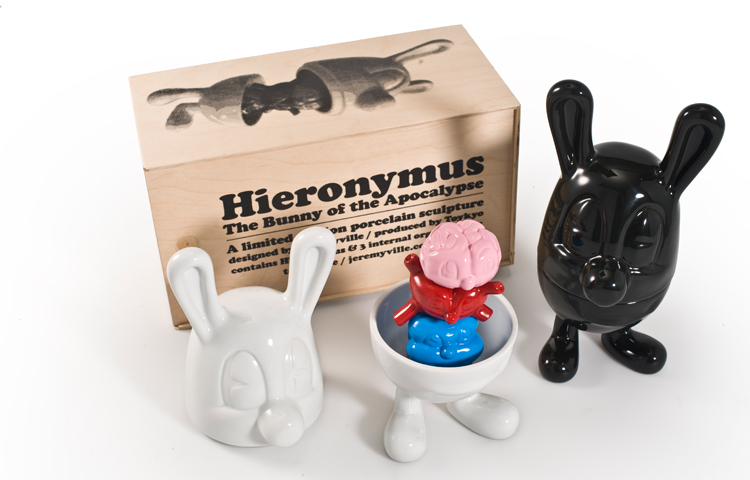 Hieronymus, the bunny of the apocalypse, is a central character in the new ‘Fragments of the Apocalypse’ series of figures and multiples dealing with the last days of pop culture on earth, the death of mass consumer icons, and the end of days in which Pop finally eats itself. Hieronymus is the first ceramic figure from this new, darker series of works by Jeremyville. Each internal figure stacks on top of each other like a totem, and the exterior Bunny closes to conceal its inner turmoil.